The America the Beautiful silver bullion coin collection was proudly announced by the American government with the help of the Act of 2008 and the America the Beautiful Vicksburg National Military Park 5oz Silver Coin 2011 is just one of the many coins to come and be welcomed by numismatists and investors. This collection has the purpose of commemorating the most beautiful and full of history places situated on American soil and the America the Beautiful Vicksburg National Military Park 5oz Silver Coin 2011 is just one great example, reminding of the Civil War. The series is a new one, it started in 2010 but it will continue to surprise investors until 2021. So a total of fifty six silver bullion coins are expected and the America the Beautiful Vicksburg National Military Park 5oz Silver Coin 2011 is only the ninth of them. The America the Beautiful Vicksburg National Military Park 5oz Silver Coin 2011 is manufactured from pure silver, 999/1000 fineness, at a weight of 155.50 grams or 5 troy ounces of fine silver and has a 3 inches diameter. The obverse of the America the Beautiful Vicksburg National Military Park 5oz Silver Coin 2011 illustrates George Washington facing left and UNITED STATES OF AMERICA, LIBERTY, IN GOD WE TRUST, and denomination QUARTER DOLLAR. The reverse of the America the Beautiful Vicksburg National Military Park 5oz Silver Coin 2011 is an engraver representative for this wonderful park, it is a reminder of its greatness and of its historic past, depicting U.S.S. Cairo on the Yazoo River. 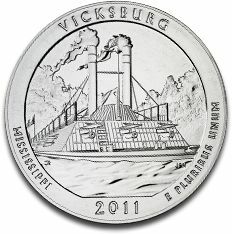 It is a design accompanied by the inscriptions VICKSBURG, MISSISSIPPI the region where the park is located, 2011 the issuing year, and E PLURIBUS UNUM. The tail side of the America the Beautiful Vicksburg National Military Park 5oz Silver Coin 2011 was beautifully designed by Thomas Cleveland and the sculptor is Joseph Mena. Noah’s Ark 2012 1oz silver coin is very much alike to its predecessor which was minted in 2011 by Armenia, however these two silver coins are worthy of a collection and have enjoyed great attention from investors around the world. The America the Beautiful Vicksburg National Military Park 5oz Silver Coin 2011 is just a beautiful and full of historic meaning way to invest into a silver bullion coin. It has a considerable weight as for investors to be intrigued and all this weight is represented by fine pure silver. A great intangible characteristic of the America the Beautiful Vicksburg National Military Park 5oz Silver Coin 2011 is its premium that will increase as new coins are added to the series and as the coins become scarcer, because more collectors and investors will see the profitable opportunity that is to own a coin like the America the Beautiful Vicksburg National Military Park 5oz Silver Coin 2011 which is made of pure silver. For those investors and collectors so eager to own the America the Beautiful Vicksburg National Military Park 5oz Silver Coin 2011 for the purpose of trading it later as a singular piece of bullion coin or with the intention of adding it to a collection that has many years to come until being completed, the America the Beautiful Vicksburg National Military Park 5oz Silver Coin 2011 is available on our website together with other coins belonging to the America the Beautiful silver coin collection, which were also released by the American government in 2011.